Realm of Chaos – Nurgle’s Children 2018 #4: Reaper Bones 77541 Carrion Worms (as Beast of Nurgle proxies) | Azazel's Bitz Box. A few weeks ago I was rooting around through a tub of Reaper Bones models when I found a few baggies that piqued my interest. Stuff like wolves and furry stuff – the kind of models that paint up pretty quickly. Amongst them were a pair of baggies originally from my Graveyard expansions (which I’d planned to paint this past summer, but…) Anyway, the “Carrion Worm” models were in there, and I thought they’d paint up pretty quickly. But then after a couple of hours of doing other things, I decided to get my fool self under control and put away those baggies. Need to finish models before starting another couple – or couple of dozen. I was largely working on my Nurgle stuff at the time, Great Unclean One, Mamon, and lots of Plaguebearers. The next day I realised something. 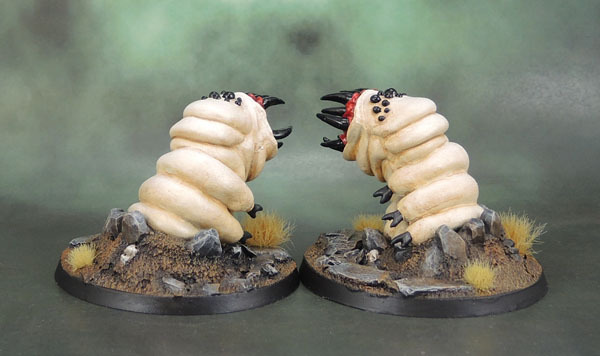 Those grub-looking things might make decent Beasts of Nurgle. I checked them out again, checked out the bases sizes of the new Beasts, got some 60mm rounds out, ruminated, then decided against it again, because Bones is a pita of a material to work with, and I didn’t have the patience for it. A few days later, after finishing the Plaguebearers, I came back to them, still sitting on the table, and started to trim down the mold lines. Within a day or two, I’d given them a coat in thinned liquid greenstuff, and epoxied them down to the 60mm bases. Another week or so, and they were done. I’m not sure how much these will end up costing at retail (they’re still not available on Reaper’s website), Edit – Doubledowndice found them on Reaper’s site – US$5.99 each. I’ll grab a few more next time I order from Reaper. but I’m sure they’ll be a hell of a lot cheaper than the new, official GW model. Not that I’m too concerned about price. I’ll probably end up with one or two of the official model, but I’m also the kind of guy who will happily use an appropriate model for a unit, regardless of the manufacturer or how “official” it is. I’ve got either one or two of the original release Beast of Nurgle as well. I think there’s one unassembled and one assembled, where I know the “flipper” hand had fallen off, and I keep seeing either the limb-less model or the loose limb. So next time I find one or the other, I’ll put it somewhere same and reunite it with the rest of the model. And see if I can find the second one. And then paint the damned things. Here’s a quick shot of my growing Nurgle Daemon army. This entry was posted in 40k, Age of Sigmar, Nurgle's Legions, Realm of Chaos, Reaper Miniatures, Warhammer Fantasy - 9th Age and tagged Beast of Nurgle, Kevin Williams, Reaper Bones 3 Carrion Worm, Reaper Bones 77541: Carrion Worm. Bookmark the permalink. I like these! Nice paint job! I could fancy some of them for my constantly-being-postponed-victorian-science-fiction project (yet not another new project)! Thanks! They’re generic enough to be quite versatile. If I wasn’t working on my Nurgle stuff when I found them they could easily have ended up in an undead force or as more generic fantasy grubs. Liquid Greenstuff is a “brush-on” “putty” GW introduced a few years ago for ease of gap filling and bubble-hole filling and the like. It’s not super great for those things (it’s okay at best) but it’s very good for giving PVC figures a first pre-primer coat. Especially Reaper Bones, which have a notorious reputation for reacting to sprays – both undercoat and varnish. It’s an issue that I’ve also personally experienced. Some people suggest that you don’t need to prime Bones, but then they suggest that you DO need to use a high-density pigment paint, like the old (discontinued) Citadel Foundation paints, or Reaper HD paints, or Citadel Base in a pinch. There’s a whole lot of advice out there on what is and what is not compatible with the damned things. I personally found (through trial and error, since Bones didn’t like me brushing on Vallejo primer) that thinning down Liquid Greenstuff and entirely painting the model with it so no PVC is showing works completely well, and that I can then spray with whatever I have to hand, paint with my normal selection of paints and colours however I choose, and then seal with my usual spray sealants. It’s also very good for any other boardgame PVC figures. I’ve used it on the figures from those D&D boardgames with great success, as it gives enough “tooth” for anything else to stick to. Actual Greenstuff putty sold by GW is actually Kneadatite blue-yellow, cut down and rebadged. Kneadatite, which can be found pretty easily in much larger quantities for cheaper than GW’s rebadged stuff (it’s literally the same product, GW purchase from polymeric, cut it down, repackage it and sell it) is a 2-part putty long used for, sculpting, gap filling, and making glued or especially pinned joins very strong. Thanks, I was just going to ask what the ‘pain points’ were with Reaper Bones. I’ve only tried to paint a couple of their minis, and ran into some problems with some paint not wanting to stick. You also just gave me a really good idea about how to reattach a Troll Arm that loosened after pinning! I’ll be trying some green stuff on him. Just added some more links! Thanks, not too get too side-tracked, but it was a metal Troll. I had cleaned, drilled holes, pinned, and super glued. Then after priming, noticed the arm was wiggling a bit. Pretty annoying. Have tried two kinds of Locktite, but neither seem to be working, so I’ll try adding some green stuff in there. Hopefully that will do the trick! Gluing the large metal arms on some of those old GW metal minis can be a pain. For all large/heavy metal model joints these days I drill, then superglue the pin in the “base” side, then a touch of superglue on the pin, tiny ball of GS on the ball, then a touch of superglue on the other hole. Push together and hold for a few seconds, and done! I also use the same method – without pins – for gluing combinations of resin, plastic and metal SM parts together (metal arms get pinned to torsos as well, though). You, sir, are the Mr Miyagi of miniature painting. The Gandalf of green stuff. The Obi Wan of…I have nothing that begins with “W” but you get the idea. Cheers for all the advice mate. Always appreciated! They are perfect for my own Nurglesque force. Not out yet you say. Where did you find them then? Yeah, they have the right combination of disgusting and silly for Nurgle. Those carrion worms are hungry! They just want to be friends! Nice idea of using them for Beasts of Nurgle. When I was trying to put together a Blood Bowl team, I was frequently on the lookout for something that would work. No one in the league ever picked Nurgle though, so I was in luck. 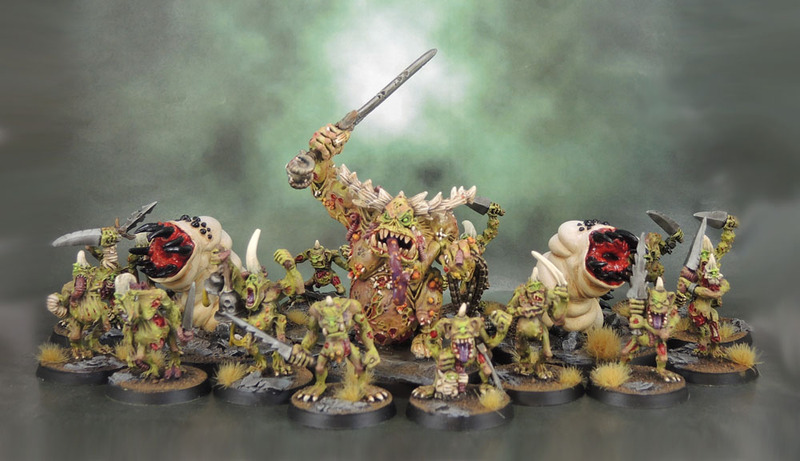 I imagine a Nurgle Blood Bowl team is looming on the horizon with the recent 40K release, so I’ll see if I need to make my own or can just buy something then. Thank you! Post updated and credit given! When I saw them in the baggie I initially just saw models I could paint quickly and easily, but then I started thinking I could use them quite easily for Beasts of Nurgle! Yeah, those make great Beasts! They just want hugs! Awesome job. Perfect weird miniature for daddy nurgle. Yeah, they’re pretty different to the official models, but then every type of official model of the Beasts have been pretty different to one another, so it’s all good! I tried painting some of their minis for D&D years ago and found them unsatisfying to work with. I think I might try your thinned down liquid green stuff approach on one I still have and see how it goes, thanks for the details in your post above. You are right, those giant maggots do seem like they’d make worthy beasts of nurgle. I’ve been looking at running some but I find I don’t really want to pay $40 each for them, lol, for something I’ll probably only use once in awhile. No problem. It doesn’t fix “floppy, bendy spear” problems, but it does sort out paint issues with both sprays and regular paints and the awful tackiness that results. As for the Maggots, you can’t go wrong for six bucks apiece! Very true, it is hard to go wrong at that price! Your avatar does look like the sort of fellow that would enjoy them! Pingback: Cheeseburger the Bear (Reaper Bones 77494: Dire Bear) | Azazel's Bitz Box.